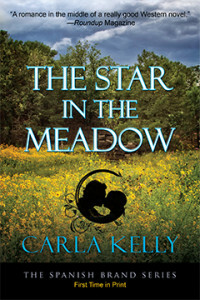 The Star in the Meadow ($14.95, 256 pp., ISBN: 978-1-60381-992-3) is the fourth and final book in Carla Kelly’s historical romance series, The Spanish Brand. The series takes place at the end of the 18th century during the decline of the Spanish Empire in the New World. In this story, brand inspector Marco is torn between rescuing his wife Paloma from kidnappers and securing the Spanish Colony of New Mexico’s fragile peace. “The novel is filled with joy in its descriptions of newborn children; fear and delight during the telling of harrowing Mexican stories; terror during a kidnapping; and charm as a possible romance between two unlikely partners unfolds. The characters’ loyalty and honesty are remarkable because these qualities are coupled with pragmatism, hard work, expectations of cooperation from everyone, and the determination to snuff out all enemies. The Star in the Meadow is classic Western fiction, a terrific yarn that is somewhat contrived but will be treasured for its carefully measured, shifting tones long after the last page is turned. Fine historical fiction!” Read more…. 5 Stars: “This story’s great strength is that it tells a darn good tale of romance and adventure in a pleasingly original way. The characters are fully formed human beings with their own strengths and weakness and history which combine to make a rich story. Ms. Kelly is a fantastic story teller and creates the right amount of drama with her descriptive prose. It is an immersive tale which keeps the reader engaged from the first page to the last!” Read more…. 5 Stars: “A fantastic story of romance and adventure! [….] This book has just the right amount of action, romance and adventures to grab your attention from the beginning to end. The characters are strong and well developed. You will feel all types of emotions while reading – hopefulness, amusement, and delight. This story told of a strength that women have when they need it most and that love can change anyone.” Read more…. 5 Stars: “This story is brimming with love, laughter, action, adventure, turmoil, heartache, and the list goes on. Ms. Kelly offers us a level of escapism that is truly worthy of the vast vistas of the old West.” Read more…. 5 Stars: “I’ve become quite invested in Marco and Paloma and their extended circle of family and friends. Their love for each other and their kindness and generosity seems to have an almost magical, healing quality that enfolds their loved ones, bringing happiness and second chances. I found STAR IN THE MEADOW to be somewhat darker than previous books, and therefore more intense. I hated what Paloma and Marco had to endure, yet I admit that I was totally enmeshed in the story. Carla Kelly’s writing is masterful, and I can wholeheartedly recommend this whole series, and I believe you would enjoy each book more if you read them all. STAR IN THE MEADOW is a stellar conclusion which will reside on my keeper shelf. I’m sad to see this magnificent series end.” Read more…. Follow the blog tour on Book Unleashed. Read Carla Kelly’s character profile of Marco Mondragon, the hero of The Spanish Brand series. Kelly is the recipient of two RITA Awards from Romance Writers of America for Best Regency of the Year; two Spur Awards from Western Writers of America; three Whitney Awards: 2011, 2012, and 2014; and a Lifetime Achievement Award from Romantic Times. The first three books in the series were enthusiastically received by the critics. All About Romance wrote that The Double Cross “packs a full story with plenty of frontier action and believable, sympathetic characters. Marco Mondragón and his wife Paloma are living hectic but happy lives at the Double Cross, on the edge of Comanchería. Five years after the death of Comanche leader Cuerno Verde, cautious diplomacy between the tribe and the colonists is underway to end Comanche raids into New Mexico. Paloma’s time has been fully consumed by her two toddlers and newborn son and Marco’s by spring planting. Unknown to him, Marco has peculiar enemies plotting his downfall. When Paloma and Catalina set out on a visit to Marco’s sister, meant to give Paloma relief from her busy life, the women are kidnapped. Devastated, Marco is torn between love and duty. He yearns to search for his wife, but feels bound by colonial duties to accompany his friend Toshua to Río Napestle, where Comanches have gathered to debate the region’s fragile peace. In his absence from the Double Cross, will Joaquim Gasca and Toshua’s wife Eckapeta be able to find the missing women? A well-known veteran of the romance writing field, Carla Kelly is the author of thirty-seven novels and three non-fiction works, as well as numerous short stories and articles for various publications. Carla’s interest in historical fiction is a byproduct of her lifelong study of history. She has a BA in Latin American History from Brigham Young University and an MA in Indian Wars History from University of Louisiana-Monroe. Click here to find Carla online. Paloma yawned and close her eyes. “I’ll never get to sleep this way,” she murmured, just moments before she did precisely that. Catalina closed her eyes, too, thinking of years of smarts and slights and rudeness. For some reason she had turned to them for nourishment, letting the sourness of unfair treatment fill her belly. Maybe she lashed out first to keep meanness at bay. She took the idea one logical step forward; it might be time to stop. With a sigh of her own, she relaxed and rested her head against the side of the carriage. She had no sense of time passing until she felt the spring sun high overhead. But that wasn’t what woke her. The carriage had come to an abrupt halt. Catalina opened her eyes to see Chato the coachman through the small opening, but only dimly, because the overhang of the carriage roof was in shadow. The shadow moved and she saw a knife sticking out of Chato’s neck. The shadow moved again and she saw a horseman, the cause of the shadow, beside the carriage now. She put her hand just above Paloma’s mouth and patted her arm. “Something is happening,” she whispered. Paloma opened her eyes and her own hand went immediately to her sleeping son in his cradle at her feet. She sat up carefully and sucked in her breath when she saw how the coachman leaned. Juanito began to stir and whimper. Paloma picked him up and hastily unbuttoned her camisa, nursing him to keep him silent. “Eckapeta and I … we train the little ones not to cry,” she whispered, her blue eyes huge in her pale face. “Juanito is too young for such a lesson.” She bowed her head over her child, trying to feed him and protect him at the same time. The pitiful gesture went straight to Catalina’s heart and shoved back her own fears. She reached for Paloma, as vulnerable now as a woman could ever be, and patted her shoulder. “I’m going to find out what’s going on,” Catalina whispered, as she wondered at her sudden wellspring of bravery. With amazing clarity, she knew someone had to protect Paloma and her baby, and there wasn’t anyone else around except her. For years her father had depended on her—perhaps too much—but that was nothing compared to this need, growing stronger by the second, to help someone even more vulnerable. “I do this for you, Marco,” Catalina whispered under her breath.